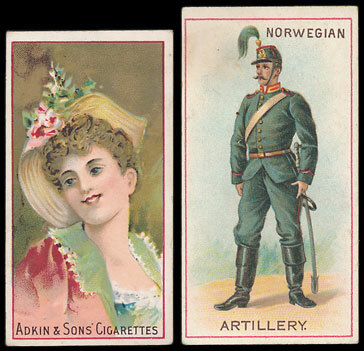 The cigarette card sale offered an excellent range of large collections and accumulations. Results were good throughout with many achieving results well in excess of their estimates. 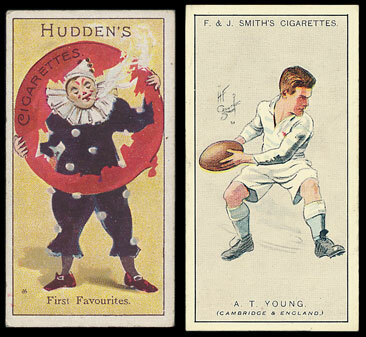 The first lot of the sale contained cricket, football and golf set by Hill, Phillips, Wills, Barratt and others. It was estimated at £500 and realised nearly £950. A collection of sets by Boguslavsky, Ogdens, Wills and many others estimated at £320 realised £620, a collection of railway sets by Churchman, L & B, Phillips, Junior Pastimes and others estimated at £320 realised £620 and a collection with a range of complete and part sets by Adkin, Churchman, E.R.B., Gallaher and others estimated £220 realised nearly £500. The sale contained an excellent range of individual sets with many manufacturers represented. Some of the better examples included an Adkin Pretty Girl Series ‘RASH’ part set of 9 cards realising £130 against an estimate of £100. A Cohen Weenen Star Artistes set realised £212 despite some cards having corner wear, a Cope Boats of the World set (less 1) estimated £300 realised over £340, a Lambert & Butler Jockeys (with frame lines) set estimated £70 realised over £140 even with some corner and edge wear. A Pattreiouex Railway Posters by Famous Artists set in good to very good condition estimated £100 made £200, Player Actors & Actresses set (less 1) estimated at £150 made almost £250, a Richmond Cavendish Music Hall Artistes set in good condition was estimated £200 and realised £260, a Societe Job Dogs set estimated £100 made £177 despite one having a crease and 2 being trimmed and a Taddy Thames Series set with No.2 being creased realised £390 against an estimate of £250. Ranges by individual manufacturers also proved popular with a collection of Adkin part sets estimated £150 making £188, a Hudden range of part sets including Beauties and Comic Phrases was estimated at £220 and realised £330, an Ogden collection of sets in an album realised over £220 against an estimate of £200 and a Phillips range of part sets and type cards estimated £180 made nearly £250. 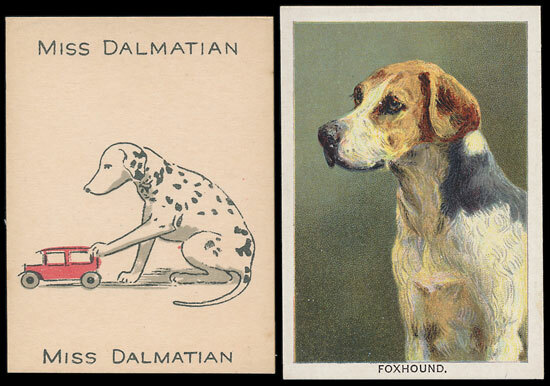 There was a good trade card selection of lots in the sale. The first mixed lot containing a range of dogs sets by Cadbury, Edmondson, Kane, Spratts and other was estimated £320 and realised nearly £380. A lot containing a good selection of football cards by Chix, Soccer Bubble Gum, Thomson and others estimated £200 made £over £350 and a collection containing sets by Barratt, Brooke Bond, Malties, Edward Sharp and others estimated £120 realised nearly £300. Three Liebig collections all realised totals well in excess of their estimtes. There was also an interesting range of individual sets with a Melox Famous Breeds of Dogs set making £95 despite some light toning, an O’Carrol Railway Engines set estimated £70 realised £82 and a Walker, Harrison & Garthwaite Dogs set (less 1) estimated £100 realised £118. Our next auction is on Wednesday 20th September 2017. This will be our biggest sale of the year and we will be offering an excellent selection of accumulations and mixed lots. 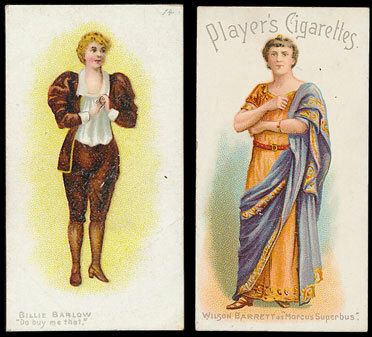 There will be a large and varied range of British and foreign cigarette card sets and an excellent array of trade card collections and individual sets.